It’s an all-new episode of The Flickcast for your listening pleasure. Yes, we made it four weeks in a row. Excelsior! On this week’s episode Chris and Joe discuss the recently announced participation of Robert Downey, Jr. in Captain America 3, Marvel also announcing that Cap 3 will tell the story of Civil War, the return of The Walking Dead, the return of Arrow, new developments on Agents of S.H.I.E.L.D., the #gamergate controversy and a whole lot more. Picks this week include Chris’ pick of the monthly box of awesome known as Lootcrate and Joe’s pick of the comic series The Twilight Zone from Dynamite comics. Trailers for comic books? Yes, and really cool ones! These books were released last week from Dynamite Entertainment and are selling fast. Get to your local comic book shop immediately and pick a copy or two of each. Buy one for you and buy one for a friend. To find a comic shop near you, call 1-888-comicbook or visit http://www.comicshoplocator.com/. Dynamite was founded in 2004 and is home to several best-selling comic book titles and properties, including The Boys, The Shadow, Vampirella, Warlord of Mars, Bionic Man, A Game of Thrones, and more. Dynamite owns and controls an extensive library with over 3,000 characters (which includes the Harris Comics and Chaos Comics properties), such as Vampirella, Pantha, Evil Ernie, Smiley the Psychotic Button, Chastity, Purgatori, and Peter Cannon: Thunderbolt. Just when you thought DC would calm down after the backlash of their drastic logo change earlier this month, they’re here to alter more of your childhood favorites by bringing us a series of prequels to Alan Moore’s epic Watchmen series from decades ago with their Before Watchmen line of books. Catchy name, right? That’s about the caliber of originality you can expect to see with these books, with the major saving grace being the talent that DC has gathered for the event. Here’s what they had to say. Stepping up to the challenge is a group of the comic book industry’s most iconoclastic writers and artists – including Brian Azzarello (100 BULLETS), Lee Bermejo (JOKER), Amanda Conner (POWER GIRL), Darwyn Cooke (JUSTICE LEAGUE: NEW FRONTIER), John Higgins (WATCHMEN), Adam Hughes (CATWOMAN), J.G. Jones (FINAL CRISIS), Andy Kubert (FLASHPOINT), Joe Kubert (SGT. ROCK), Jae Lee (BATMAN: JEKYLL AND HYDE), J. Michael Straczynski (SUPERMAN: EARTH ONE) and Len Wein (SWAMP THING). Take a look at some of these titles after the jump, and expect to grab these books when they hit this summer. Vampires may be yesterday’s Zombies, but that doesn’t mean they still don’t look cool while wearing leather and killing werewolves. Luckily enough, that means it’s time for another installment of the Underworld series. There was a nasty rumor that Kate Beckinsale wouldn’t return for this sequel a while back, but that was immediately quashed. Here’s what we can expect to see from the plot, courtesy of Bloody Disgusting. So basically, this is Kill Bill with leather-bound vampires and scary werewolves. We aren’t complaining, but do they think this was an original idea? Let’s hope so, as Sheild writer John Hlavin and comic favorite J. Michael Straczynski are taking on the script. Catch Underworld 4: New Dawn in theaters in both 3D and 2D on January 20th, 2012. It looks like DC Comics has decided to make a few changes to one of its most enduring characters. To commemorate the 600th issue of the Wonder Woman comic, the publisher has decided the character needs a makeover. Wonder Woman‘s costume is being changed to reflect her new origin by the incoming creative team of J. Michael Straczynski and artist Don Kramer. The costume was designed by Jim Lee, one of the top comic artists in the industry who was also named co-publisher of DC Comics earlier this year. In the rebooted origin story conceived by Straczynski, unknown forces have changed history by destroying Wonder Woman’s island home in the past. Now, she was raised in the outside world by a few surviving Amazons, giving her greater ties to both humans and Amazons. She is also less powerful than before, but her powers may return as things progress. Check out larger versions of the new Wonder Woman after the break, courtesy of Deadline. Wonder Woman # 600 is out in comic stores today. Are you happy with the changes to Wonder Woman or do you think they should have left her alone? Good news for comics and Sci-Fi fans: Babylon 5 creator J. Michael Straczynski, who’s no stranger to the world of comics having penned several titles for Marvel, will be taking over DC Comics’ Superman and Wonder Woman titles on an ongoing basis, starting in July. Starting in July with SUPERMAN #701 and WONDER WOMAN #601, superstar writer J. Michael Straczynski—a man who’s created layered and compelling characters and worlds on the big screen, on television and across the comic book spectrum—dives head-first into the DC Universe by taking the ongoing writing reins for two-thirds of the fabled DCU trinity. “For as long as I’ve been doing conventions (starting in the early Cretaceous period, when it was just me and a handful of pterosaurs on a panel debating whether or not mammals with opposable thumbs were really necessary to the writing of quality comics, a point still hotly debated today), there has always been the same question from folks in the audience: “Is there any one character who is your dream character to write for?” The answer has always been the same: Superman. When I first came over to DC, that dream was realized in part by Dan DiDio’s gracious invitation to write the first of potentially many Superman original graphic novels. Now the dream has come fully true with the opportunity to write for the mainstream title, in a story that returns Superman to his roots in a way that will have the whole country talking about him in ways that we haven’t seen in a long time. With both Chris and Matt extremely busy and the American Thanksgiving this week, you know what that means? The Canadians are taking over The Flickcast (are you with me Sal?). Having celebrated Thanksgiving weeks ago, we’re in the clear to keep the geek news coming while our neighbors to the South take a few days off. So be prepared to face sentences ending with “eh”, weird dialect (can you say “aboot”) and an abundance of unnecessary apologizing. Alright, maybe I’m overstating all that but let me take a moment to wish a very Happy upcoming Thanksgiving from all of us up North. The great thing about this is that Stracynski is one of the best character-driven writers in the industry in my opinion. As great as the zombies will be, the characters should be as equally entertaining to watch. We can’t wait to see World War Z move forward and will keep you posted as more news develops, eh! Even with Thanksgiving right around the corner, that hasn’t stopped Marvel from dropping some great comics this week for your reading pleasure. Some of the one’s we’re particularly interested in this week include the latest issue of Avengers: The Initiative, the new Hulk, the latest Criminal: The Sinners and Dark Wolverine #80. 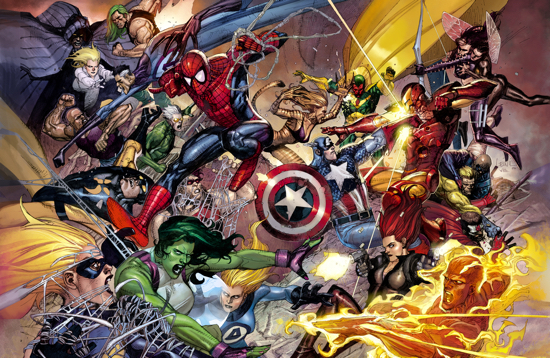 Be sure to check out the list of all the upcoming Marvel comics below. And, as always, be sure to click through for some cool cover art from some of these comics after the jump as well. Now go and enjoy some Thanksgiving comics. We’ve been pretty excited for Warner Bros.’ newest action film, Ninja Assassin around the office, and we just came across a few clips that got us even more excited. The film hits theaters a week from Wednesday, but we thought it would be okay if we gave you on a sneak peak now. The film, co-written by comics’ “Who’s Who” J. Michael Straczynski, is about a cult of ninja killers who raise a boy to become a superior ninja. Later, he learns that the ways of his clan need to be stopped. Straczynski has been the man behind such other fan favorites as Spider-Man and Silver Surfer in comics, and Babylon 5, Jeremiah, and even The Real Ghostbusters on TV. In both 3D and Digital theaters, the film is said to be visually stunning. With James McTeigue (V For Vendetta) behind the wheel, you can believe that the film won’t be boring. We’ll be sure to have plenty more coverage of the film, including a review next week. In the meantime, check out these new clips (totaling nearly 7 minutes!) from Ninja Assassin, in theaters November 25th.